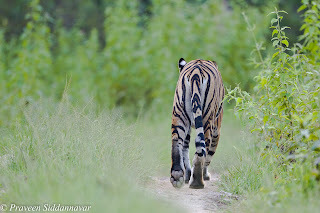 Praveen Siddannavar's Blog: The Prey and Predator! Saturday - October the 2nd 2010, another exciting day in Bandipur Tiger Reserve and of course one cannot forget that “The Father of our Nation” – Mahatma Gandhi ji was born on this day. We drove quite early in the morning into the forest, it had rained quite a lot the previous day and the forest was at its best. 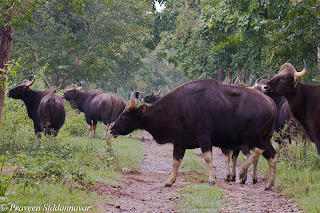 As we drove past a water hole called Karigowerna katte, & were heading toward daiyad katte, from a distance I saw a large herd of India Gaurs (Bison’s), right on the middle of the track. 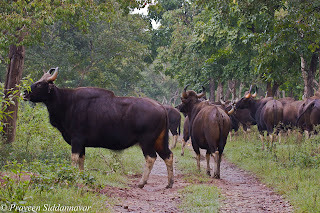 Most of the times the gaurs disappear into the bushes as they see humans or if a jeep is approaching but on this occasion even after seeing us driving towards them the gaurs were unmoved. I noticed that all gaurs were looking in one direction. We sensed that something is wrong, I was in the front seat and Basavanna our naturalist was driving. I told Basavanna to slow down the jeep and after few yards we stopped. The gaurs seemed very nervous & were still looking in one direction that is on our left, few gaurs we were snorting, hoofing & we could clearly hear the sounds. 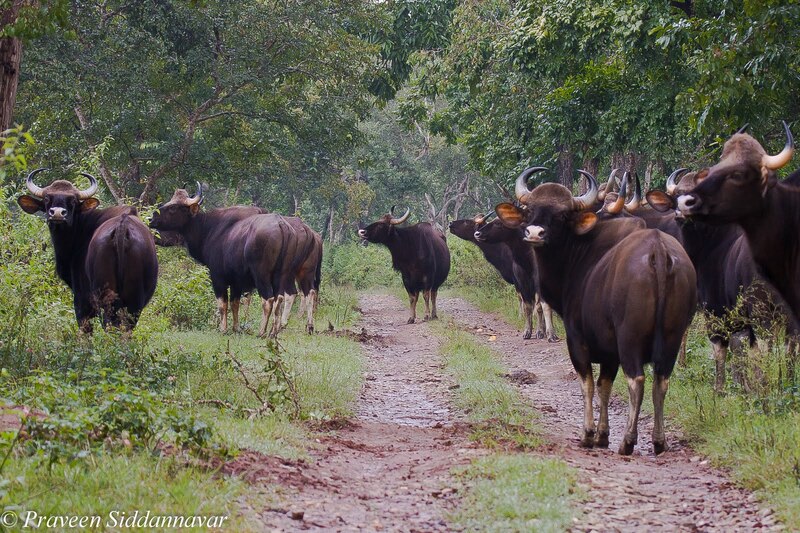 We patiently waited for 20 mins, the gaurs didn’t move & had blocked our way. After a while, all of a sudden, the gaur that had a calf started charging towards the bush on our left and was clearing our way so we decided to move on. As the gaur charged towards the bush, a tiger that was probably was resting in the bushes pounced on the calf. It was a narrow escape for the calf & the mother. What we could see is just a glimpse of the tiger and its paw that attacked the calf, the action happened in a fraction of a second. None of us expected this & were in a position to click & take shots. Believe me seeing a tiger attacking a gaur live was some experience, it was just out of the world. To me this was by far one the most thrilling and amazing moments that I have ever had in the forest. It was a panic situation for the gaurs, our focus was diverted from gaurs and now we were desperately looking to find the tiger that had disappeared in the undergrowth. Unlike human beings animals don’t waste their energy. The tiger was smart enough to sense the large herd 40+ & it knew that he had no chance to fight the herd. 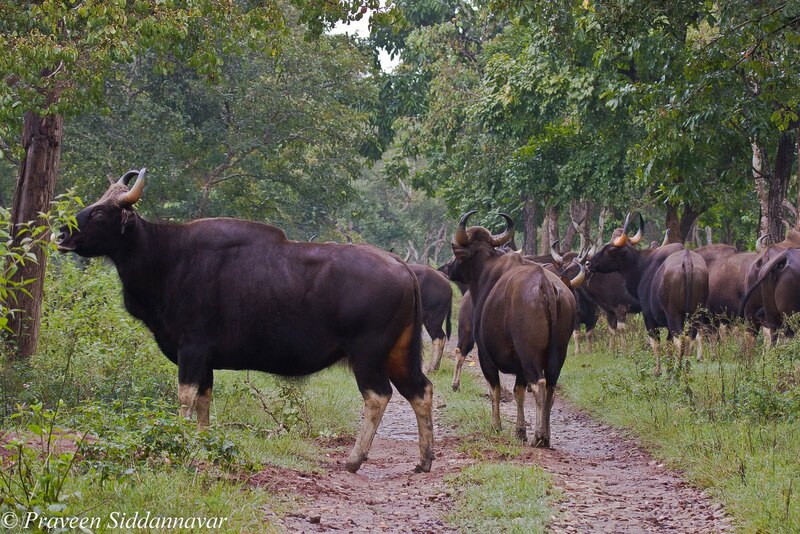 A couple of years ago a bull gaur had killed a tiger at Nagarhole forest in Karnataka state, so gaurs are not an easy prey unless the tiger attacks calves or sub adults gaurs. Later the tiger moved I guess through the bushes as we heard langur (monkey) alarm calls on the other side. We left the gaurs undisturbed and moved on to track the tiger. After searching most of the expected water holes finally we decided to give up as we could not find the tiger and thought we will drive towards the anti-poaching camp. As we were heading towards the camp to our luck at a distance I sighted a tiger at a distance walking on the middle on the road, I am not 100% sure if this was the same tiger as this seemed a sub adult (female). The tiger was not really bothered though she knew that we were right behind her. I asked Basavanna to keep distance since I wanted some images of her face. She never turned back, we followed & followed her for almost 15 mins but she was in no mood to turn and look back. Later we left the tiger in peace and headed back to the exit gate, sometime we have to live with this & be satisfied. Sighting a tiger itself was exciting and seeing a tiger attack a gaur was simply out of the world, I had seen such moments in Nat Geo, Discovery & Animal Planet documentaries , can’t ask for more. Wow! This one has left me breathless, speechless. One of most exhilarating experiences in forest. 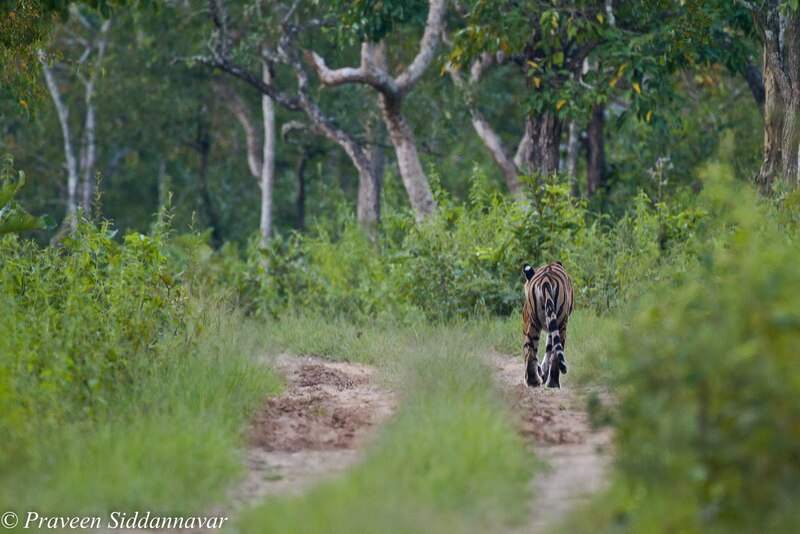 The Handsome Male of Bandipur! Leopard with a Hare Kill! The Power Of Striped Cat & The Macho! The Elusive Cat of Bandipur!